Potato chips were invented about 150 years ago in Saratoga Springs, New York by a chef that sliced potatoes so thin you could see right through them. Now, years later, potato chips are munched on in many countries around the globe. A regular potato chip factory makes thousands of chips each hour. Below is a little description of how this happens. Farmers grow special chipping potatoes that have a long shape for easy cutting. These potatoes are high in starch and low in sugar so they stay fluffy on the inside and turn light brown when they’re fried on the outside. After the potatoes are picked they are sold to the chip company. The potatoes are stored in temperature controlled environments, if not, their starch turns into sugar and will ruin the potato. Potatoes can be stored this way for about 4 months. The potatoes are washed and a machine rubs off their skin and sorts them by size. The potatoes move along a belt to a slicing machine that slices them quickly using a razor-sharp blade. 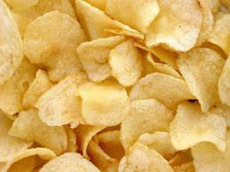 Ripple potato chips are cut by a serrated blade. The potato slices are washed to get rid of the starch that seeps onto the edge of the potato once it is cut. The potatoes are then put into a vat of vegetable oil that always bubbles at 190ºC (375ºF). As the potato chips cook the water inside them turns to steam. The steam travels upward and the space that the water took up in the potato slice is replaced by the oil, making the potato chip crisp. When chips are cooked the starch in the potato turns brown and inspectors ensure that the chips are the right colour before removing them from the vat. The chips are salted and flavoured and fed into large containers, then weighed and dumped into packages. Packers pack the bags and the chips are delivered to warehouses all over the country. When a store wants potato chips they place an order with the warehouse to receive their shipment.